John had insisted on creative consultation rights for the series, but he found himself in conflict with the producers over how much they would be willing to accept him as a creative partner. The problem he confronted with Goodman-Rosen, the line producers, was to be revisited with each new Zorro project. Hollywood producers have a notorious reputation for paying rights holders and expecting them to disappear once the contracts are signed, but rights holders must exercise controls to protect the integrity of their characters to insure the property into the future. John's concerns regarding the pilot were summarily ignored by Goodman-Rosen. His chief complaint was the violence. The plot involved numerous killings and generally lacked humor; a critical part of the Zorro formula. Gertz felt that the music was terrible and that the original casting was by and large a disgrace. Nancy's treatment had again been abandoned in favor of the concept of the producers, Goodman-Rosen. 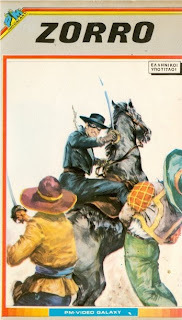 Antonio de la Cruz, the nephew of Don Diego, takes up the mantle of his boyhood hero when Zorro is killed by the commandant, Monastario. One element of Nancy's treatment was retained: Antonio played a clumsy scholar with glasses whose heroes were da Vinci and Cervantes. The pilot featured Patrick James as Zorro and Patrice Martinez as the female lead, Dona Maria Constansa Arrillaga, a spoiled, rich girl to whom Antonio was betrothed. Antonio does not endear himself to his arranged marriage partner,harboring memories of Maria as a fat and homely child. Yet she has grown into a feisty, dark-haired beauty. Maria's feelings about Antonio echo his own about her. She is, however, very impressed with Zorro. In the climax, Antonio uses his knowledge of da Vinci's principles of flight to build a hang glider, which he dramatically sails into the plaza to rescue falsely convicted men from execution. Location shooting took place on the southern coast of Spain near Almeria in November 1987. Many of the extras were retired Brits who had abandoned their foggy isle for the warmth of the Mediterranean coast. Almeria ahd been the location for filming many spaghetti westerns, possibly even some of the European Zorro films from the 1960s and 1970s. Gertz fumed on the set, watching a nightmare unfold before his eyes. Based on a disastrous pilot, interest in teh revival of Zorro as a live-action hero fell short of attracting the required funding partners. The fox once again seemed headed toward a short-lived revival. Although Patrick James looked the part of Zorro, his limited acting experience had not prepared him to meet the challenge of playing the fox. The producers went back to the drawing board, revamping the concept and addressing some of Gertz's concerns. The story line reverted to a traditional Zorro scenario without the oppressive violence. The fox had partially been rescued. Congrats and Hoping to see more.